The bare branches of these shrubs are clothed with flowers in spring, The Myrobalan plum is popular for its edible 'Cherry Plums' that appear later in the season. Wild varieties of plum or Prunus have their roots in southeast Europe and western Asia and are a very useful addition as a hedging plant having become naturalised in Great Britain. There are several species most of which provide attractive leaf colour, very pretty, white or pink blossoms and various types of fruit with the latter two being beneficial to insects and birds. 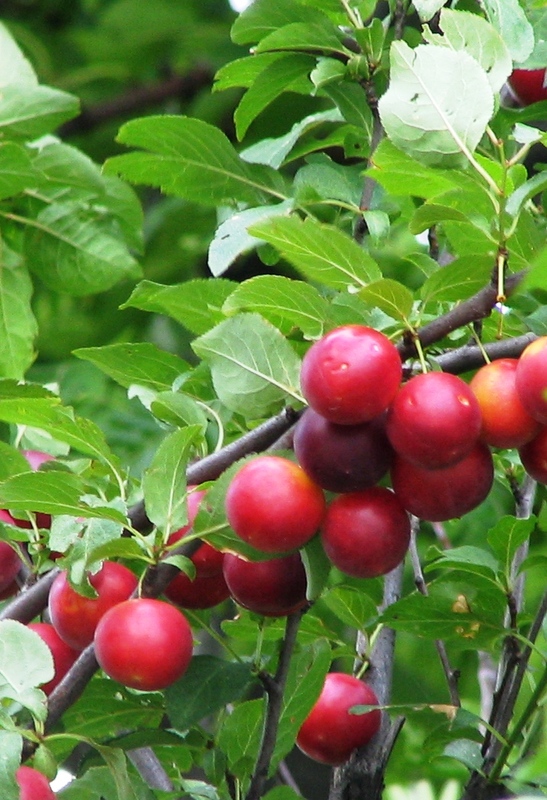 Prunus Cerasifera or Plum Myrobalan, commonly known as Cherry Plum, is one of the more popular hedging plums. This thorny, deciduous small tree or large shrub is smothered in white flowers in early spring which develop into cherry plums in autumn making it a very pretty but security orientated hedge growing up to about 2 metres. There are also more shrubby varieties of Plum hedging plants with even more outstanding purple or reddish-purple foliage if a different colour other than green is required. The Plum Crimson Dwarf or Prunus x Cistena is a smaller growing variety to about 120cm with rich purple-red foliage, contrasting white blossoms and dark red cherry-like fruit whilst the Plum Purple Leaved or Prunus Cerasifera nigra which will grow to about 2 metres has darker purple-black foliage and softer pink flowers. Plum Purple Leaved is also useful if a variety of colour in the hedge is required as it can be planted with Plum Myrobalan at a suggested ratio of one Myrobalan to two Purple Leaved to give contrast in leaf colour and blossoms. Grown for their early blossoms, sometimes as early as February before the leaves have opened, wild plum plants are useful not only for their thorny habit and for wildlife, but if you can get there before the birds, the edible fruit can be eaten straight from the bush or in some cases if too sharp in flavour make wonderful jam and with the darker purple fruit an intensely rich colour. In eastern Europe especially, Georgia wild plums are an essential ingredient of their cuisine and some purple leaved varieties are used for bonsai or living sculpture. A truly versatile and useful plant the wild plum would grace any garden, urban or rural, as hedging or in some instances an ornamental tree.